This is a write-up on how I hooked my JJP Hobbit Pin to the Internet, enabling live streaming directly from the pinball machine, and allowing people to interact with my pin by displaying messages and images through the Internet on my pinball backglass. All changes were to software, with the exception of plugging in a few cords. n8 will be presenting his recent research on several Microsoft Exchange Client Access Server vulnerabilities “Penetrate your OWA” at PasswordsCon 2014 in Las Vegas on August 5th, 2014. Two Metasploit modules are available for public download. The download links can be found below. exchange_iis_internal_ip.rb – This module allows for extraction of internal IP addresses. owa_login.rb – This version of the module has an authentication timing option. These modules will appear in the Metasploit framework shortly. The Client Access Server (CAS) that services Autodiscover and Outlook Web App (OWA) has been found to be vulnerable to time-based authentication attacks. It has been discovered that when sending authentication requests to the CAS, behavior in the timing of the responses can be used to verify Active Directory (AD) realms and usernames within those realms. Authentication timing issues have been found in specific IIS file paths and OWA form-based authentication. This issue can allow an attacker to confirm the existence of a specific username in the directory, and will make other attacks such as password guessing or social engineering attacks more successful. When analyzing the response times of authentication requests, there is a noticeable time delay between realms and usernames that exist or don’t exist. It is believed that the underlying issues exists in Windows Kerberos. When the CAS sends authentication requests to the domain controller (KDC) the pre-authentication process is staged in such a way that noticeable time delays exist. OWA form-based authentication and IIS file paths were found vulnerable to this timing delay. The services and authentication paths that have been found vulnerable can be seen below in Table 1. During the testing of the IIS file paths, HTTP NTLM authentication requests were being used. Typically, the realm name, username, and password is required for authentication. There is a case where the CAS can be configured so that the realm name isn’t required and authentication can be accomplished with just a username and password. In this case, the realm name doesn’t need to be known and usernames can be enumerated. Table 2 below details the Windows Kerberos process and approximate response times seen when sending requests to vulnerable services. It should be noted that system resources and network configurations can play a role in response time variations seen. 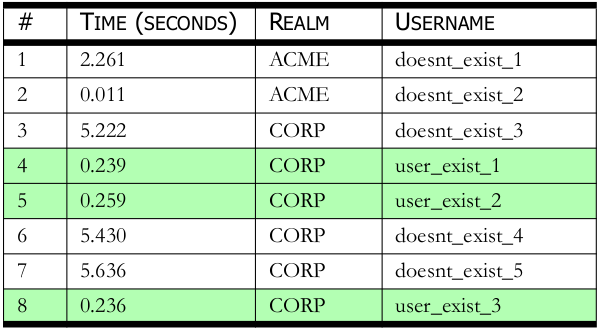 During authentication, when the realm exists but the username doesn’t exist, these times can vary from system to system but the resulting time response is the same average time. For example, it has been seen on a OWA/Forefront TMG 2010 setup that when sending authentication requests to the EWS path, every authentication request will take approximately 60 seconds to respond. When sending form-based authentication requests to OWA 2013, every authentication request can take approximately 15 seconds to respond but another system running the same configuration with more system resources could take approximately 5 seconds to respond. As seen above, the response times in different environments may have different response times but the pattern in the timing response behavior patterns still exist. • Non-existing realm – It has been seen that when a non-existing realm names are being tested, that the first request takes 2-3 seconds, and then all requests thereafter take less than one second. What is believed to be happening here is that the first request is searching for the realm and fails but the search response is cached on the CAS for 30 seconds. Thus, the 2-3 second response is seen every 30 seconds. • Realm exists but username doesn’t exist – A pre-authentication ticket is created to verify the username exists in the realm. The average time of the request can vary depending on resources but the resulting time response is consistent. This could be either approximately 5 seconds or higher. The highest response time seen is approximately 60 seconds. • Realm and username exists – A pre-authentication ticket is created to verify the password. The time in seconds has been seen to take less then 2 seconds but in most cases this response time is under one second. Table 3 below details an example of the timing attack analysis. This test was completed against a fully patched Exchange 2013 environment running Windows 2008 R2 server. The OWA 2013 form-based authentication response times were being monitored. The domain CORP is a valid realm and the usernames user_exist_1, user_exist_2, and user_exist_3 are valid account names. The results are described below. • Non-existing realm – This can be seen in response # 1 and 2. • Realm exists but username doesn’t exist – This can be seen in response # 3, 6, and 7. • Realm and username exists – This can be seen in response # 4, 5, and 8. The issues detailed allow an attacker to enumerate AD realms and usernames which could lead to further compromise. There are many ways to identify realms and username formats, such as searching public databases, stripping metadata from published documents, by reviewing SMTP mail headers and services, or even by obtaining wordlists of the top most popular first and last names and creating a list of correctly formatted usernames to try with a brute force attack. The impact should be categorized as an information disclosure vulnerability. The Microsoft Exchange Client Access Server (CAS) that services Autodiscover has been found vulnerable to an information disclosure. It has been discovered that a standard domain user without Exchange permissions can enumerate Autodiscover configuration files of Exchange users by an XML SOAP parameter injection. This issue can allow an attacker to confirm the existence of a specific email addresses. The type of information that is disclosed are things such as, legacy accounts and their username formats. The end user’s full name is also revealed which could aid in locating a user’s account. Exchange services, permissions, and the location of the domain controller that handles authentication are revealed as well. Autodiscover is a CAS service that is used to configure remote or internal mail clients for use with Exchange systems. Using a compatible mail client, the user can configure their client by providing an email address and password. The mail client goes through a discovery process to locate the remote CAS server hosting the Autodiscover configuration file. The configuration file is hosted on an IIS web server. By default the configuration file path is “/Autodiscover/Autodiscover.xml”. To access the Autodiscover.xml configuration file, an XML SOAP request is sent to the server using an HTTP POST method. Server side application controls require the User-Agent header of the request must represent that of an Outlook client, such as “Microsoft Office/12.0”. The body of the SOAP request can be seen in Figure 1. By examining the body of the SOAP request made, it was found that modifying the “EmailAddress” parameter to utilize another existing email address, the user’s configuration data can be enumerated. Using a single set of valid credentials, it is possible to inject the “EmailAddress” parameter to discover valid email addresses and gather data about the users and the environment. It was also found that even though valid Active Directory credentials are required to access the Autodiscover.xml file, it is not required to be a valid Exchange account with mailbox permissions. There are many ways to build an email address list that can be used when injecting the “EmailAddress” parameter, such as searching public databases, stripping metadata from published documents, by reviewing SMTP mail headers and services, or even by obtaining wordlists of the top most popular first and last names and creating a list of correctly formatted email addresses to try with this enumeration attack. Allows an attacker to enumerate Exchange user and environment information which could lead to further compromise such as password guessing attacks, social engineering, and learning about internal systems. The impact should be categorized as an information disclosure vulnerability. Multiple issues have been discovered that make it possible to disclose internal IP addresses of remote Microsoft Exchange environments. This includes internal addresses of the Client Access Server (CAS) which hosts services such as Outlook Web App (OWA) and Autodiscover. This also includes internal addresses of the proxy or gateways processing requests for the OWA. A proof of concept example can be seen below in Figure 1. All the vulnerable IIS paths discovered and there affected product versions can be seen in Table 1. Note that some of the file paths disclosed are vulnerable if default settings have not been changed. Some of the paths have been found vulnerable based on system administrator changes. It has been shown in OWA 2007 and 2010, that it’s possible to reveal the internal IP address of the reverse proxy or gateway processing requests for OWA. Such proxies or gateways include Forefront TMG 2010. This attack can be performed using a web browser. When attempting to trigger ASP.NET debug and making a GET request to the OWA path “/owa/auth/trace.axd”. The OWA throws a server side exception with a web server status of 403. The verbose error reveals the internal IP address of the proxy or gateway. Example output can be seen below in Figure 2. An error occurred and your request couldn’t be completed. If the problem continues, contact your helpdesk with this HTTP Status code: 403. Allow an attacker to gather information about the internal network. Only attack two is fixed in current versions. Apply the latest supplied vendor patches. Certain Lexmark devices are vulnerable to unverified password changes and stored cross-site scripting attacks. Certain models of Lexmark laser printers and MarkNet devices are vulnerable to an attack which allows a remote unauthenticated attacker to change the administrative password of the printer’s web administration interface. The interface does not perform sufficient validation of the vac.255.GENPASSWORD parameter in POST requests to the /cgi-bin/postpf/cgi-bin/dynamic/config/config.html page, allowing an unauthenticated remote attacker to reset the administrative password to an empty string. Certain models of Lexmark laser printers are vulnerable to stored cross-site scripting attacks. The printers’ administrative web interface does not perform sufficient validation of user input to the “Location” and “Contact Name” fields in the “General Settings” configuration page. An attacker may be able to run arbitrary script in the context of a victim’s browser. The attacker may also be able to gain full administrative control of the printer. Lexmark advises users to update to the latest firmware version. A list of affected models and firmware versions, as well as accompanying fixes, can be found at Lexmark’s advisory page. We are happy to announce our first release of Faraday (beta), an open source collaborative Penetration Test IDE console that uses the same tools you use every day. We built a plugin system, where all the I/O from the terminal gets interpreted, if we have a plugin for the command, the output is processed and added to a knowledge base in a transparent way. Our idea was to build a tool that helps from the perspective of a pentester without changing the way you work, adding the support for multi user collaboration on security testing projects. Developed with a specialized set of functionalities that help users improve their own work adding collaborative data sharing, indexation and analysis of the generated knowledge during the engagement of a security audit. I recently gave the talk “Insidious Implicit Windows Trust Relationships” at BSides Detroit. You can download a PDF of the awesome slides and notes here. Thanks to my foofus.net colleagues for their prior work to make this possible.